Note: This introduction remains here only for what may glamorously be called archival reasons. It has been superseded by several introductory pages, which begin with this page. The revised introduction pages incorporate all the updates here and several other revisions to enhance clarity and authenticity. Welcome! Music is an ocean, and Tyagaraja's music is the nectar arising from it. Tyagaraja sangeeta amrta(nectar) is so much better enjoyed if we understand his lyrics well. This website is an effort to aid such understanding by providing authentic lyrical translations of his kritis (songs). Many good prose translations exist. But they can only deliver the meaning. A poetic translation can convey the beauty, intricacy and fervor of Tyagarja's kritis much better. In the Carnatic tradition, as the composer is the librettist as well, a lyrical translation will highlight the beauty of the poetic aspect which may not often be fully enjoyed while listening to the music. This is even truer, when we encounter extraordinarily beautiful poetry as kritis- such as the evergreen 'Manasa Sancharare'. It is such good music, that we often may not realize it is such good poetry too! A skillfully written lyrical translation can capture the beauty of the original Sanskrit verses in a way, no paraphrase or prose synopsis can. How else can we match the ebb and flow of the original? How else can we convey so fine an imagery like "mukhachandra chakore"? For me, personally, I have heard people sing even this short song, without a clue about its meaning, or just a rudimentary understanding, particularly in the years after it was featured in a famous movie. This to me was sad, because they just missed the joy of the original poetry! Nor could they fully communicate it to their listeners. For many years, I had wanted to translate this song into verse, and then one fine day, did do it. Eventually, I set out to write a formally researched book and this site came into being. I post content from the book as it is being written, so that I may receive feedback, criticism and suggestions as the work is in progress and so can improve it. I consider such revision a good editorial exercise. Further, if health and other issues do prevent me from completing this work, at least the portion I have completed, might still be available on the web. Another use of lyrical translations, is the cross-cultural context. Perhaps, someone from another culture interested in Carnatic music, may be able to "get" the kritis much better through lively poetry in a familiar language like English, than from a dry but faithful prose summary. A clear example is the "durmargacara" song. The reader may find that the lyrical translation portrays the strength of sentiments expressed by the composer very well. The lyrical translations on this site are in uncomplicated English verse. I maintain sentence and line order of the lyrics and often the word order. Therefore, a word-for-word translation is also embedded in the English verses. After each Kriti, pertinent cultural, literary and historical notes are provided. These often include comparative studies with western literature and music. The songs are chosen and the commentary written such that major themes in Tyagraja's work and Indian culture in general, such as Nadopasana or 'Music worship' and Vedanta or modern Hindu philosophy, are gently but comprehensively developed from the roots. Once we have a sufficient number of songs, I shall try to provide notation, music criticism and some manodharma (improvisation) examples, so that anyone trying to learn the kritis, can easily understand and perform. I will also experiment with metrically equivalent translations when possible and applicable. Certain other carefully selected songs from other composers are also covered on this site for the sake of contrast and completeness. I can reasonably vouch for the authenticity of the content on this site. If you still find errors, let me know. Poetry is a finer art than music, in the sense that, music being more fundamental, almost all people can appreciate it. Appreciating fine poetry is an acquired taste, needing some discernment. Even many well educated people, read in music, do not have the turn of mind for poetry- and I have seen this personally, at the highest levels of science- PhDs who "get" music, but can't "get" poetry. Further, the study of literature is on the wane worldwide and modern Carnatic concert performers contemptuously subordinate lyrical detail to phrasal development. But, if Tyagaraja's lyrics, i.e. his poetry had not been so powerful and evocative, would we even be speaking of him, two hundred years later? If his lyrics were weak and only his music good, what would have happened? Carnatic music is not like symphonic music. Only a little is provided by the composer and not the entire score. The performer has to develop and improvise the rest. Without good lyrics, all that would be left of Tyagraja would be a trampoline on which musicians perform their improv gymnastics. Ironically, I have seen even a few front line singers not realize this. So, for many reasons, including the refinement of poetry as an art, and the ignorance of the modern day, poetry is harder to "get". Poetry requires natural ability. If one is not born with musical talent, there are so many academies and teachers, that may train one to be a musician. But there is no school, nor any training for becoming a poet. A poet must be born. We know that Sonti Venkatramana was Tyagaraja's main guru for music. But, whether it is Tyagaraja or your humble servant, there is no guru for writing poetry that we could speak of. Yet, over the centuries, we can name only one or two musicians like Tansen, but we can name many poets like Kalidasa, Dandin, Magha, Valmiki, Homer, Virgil, Goethe and so on. Ironically, more poets have gone down in history. Even after music recording was invented, far more people read literature from Caruso's time, than listen to the great Caruso himself. Still, Poetry is an under-appreciated art; with Tyagaraja, a criminally neglected aspect. I hope the verses here fill some of that void. To sing Tyagaraja well by rote is one thing. To sing Tyagaraja with complete understanding and control, is completely another,- one that tells the Triton from the minnows. Ultimately, Tyagaraja's music should not be listened to; Tyagaraja's music must be experienced as a whole! About 600 of Tyagaraja's songs are now available. My estimate is that about 100-200 of his kritis lend themselves well to such lyrical translation. And strangely, some melodious and well liked songs do not have much translatable lyrical content. An example is the popular "Sitamma maayamma"... where most of the lines name the divinities and holy persons who, to him, make up Tyagaraja's circle. The sentiment is so nice, but still, we can't translate much beyond the literal. So, the songs here do not follow any canonical order, but evolve firstly, on the basis of the transferable lyrical imprint and secondly, the development of themes in them. I hope to include as many of the 600 as possible. This is one of the foci for this site. Most often, writers on Carnatic music, presume an element of praxis in their intended readers, and may include praxis or devotional details, than only the musical, literary or critical. This is because most of this music is devotional and most of the audience, culturally homogeneous. Departing from this, I do not not presume a kind of reader, and though rendering respectfully and faithfully, I shall make the songs accessible to even those unfamiliar with the culture of that region. For instance, for so many kritis, we may summon up hundreds of cross-references from the Gita, the Upanishads or the Puranas. That makes the work more re-interpretive commentation than a faithful presentation of musical, lyrical or literary detail. I shall provide such references only as necessary to convey the meaning of the original. I shall try to maintain a balance between the critical, academic and dispassionate, on one side and the faithful and lively on the other. While making the songs accessible to all people, I also develop the content extensively and rigorously, so that depth is nowhere sacrificed for accessibility. So, both, the informed and the new reader or listener shall find the content informative and enjoyable. The whole shall concurrently be accessible to both kinds of readers. I shall also claim some uniqueness in this regard, even for my small attempt. To reiterate, I presume no knowledge of Indian culture, history and music on the part of the reader. I would like to make Tyagaraja accessible to anyone, from anywhere, who is curious about Carnatic music. Therefore, the verse translations are intentionally uncomplicated and evoke familiar themes like "O come all ye faithful", "Joy to the world", "Ode to joy", "La belle dame sans merci", Shakespeare and "Scarborough Fair". The reader may well come from the opposite end of the world; but I gently introduce him to the culture of Tyagaraja's region, as we go along. The informed reader on the other hand, will find here, an extensive and well researched treatment of Indian culture and philosophy. This makes the site accessible to both the versed reader and the new one. The many comparative studies highlight such a treatment of the subject. I believe that we do make certain new contributions of some merit here, including authentic lyrical translations, a dispassionate, rigorous and yet faithful treatment, extensive commentary based on formal research and numerous comparative studies. Most important is our viewing Tyagaraja the lyrical poet, as being distinct from Tyagaraja the composer and placing him in the world of his time, and highlighting his context and his cross-cultural appeal in the modern day. I hope this work persuades the reader that these contributions are not insignificant and that the claims of newness are true. While we are looking mainly at the literary, philosophical and cultural aspects of Tyagraja here, I do plan to add music criticism, notation and improvisation examples. I consider the completion of 150 songs to be the threshold to cross before including musical detail, because by then, this blog would have met its purpose. Until then, you'll only find perfunctory musical details here. It takes anywhere from 30 minutes to two hours to edit, translate, commentate, format and post a song. It may take up to 3-5 hours for a Pancharatna (Five Gems) song. The actual time to translate and write the poetry is quite little. Much of the time goes towards cross-validation of the lyrics, in case that is required for a song. This depends on the number of known versions and any history of pitfalls. Depending on the subtlety of the song, it might take much time to commentate- the notes for the Pancharatna songs are particularly copious. It takes so much time to keep the content here as error-free and authentic as possible and to be the definitive source. The point is certainly not the time and effort we spend on the website, but the intent. Our intent is not to provide a compendium. but to provide a complete, reliable and enjoyable resource. Our aim, by casting new light on him, is to spread another dimension of the joy of Tyagaraja. Otherwise, when many books and websites already serve as compendia, there is no need for us to do this work afresh, that too, in the 21st century. We shall begin with 'Sri Ganapati ni' and end with 'Ni naama rupamulaku', as is appropriate. We will thus begin and end our journey in the Raga Sowraashtram. In some places, to give a better translation, I do take poetic license from the literal translation. Such cases are always noted in the comments. Eventually, we shall move from blogger.com to a dedicated website. If you would like any particular song posted, please email me. When translating between two very different languages, it is not easy to maintain word order and still be readable and I hope the reader appreciates the art behind this work. The sahityam (lyrics) for each song in Roman script and the translation are given side by side. The Pallavi, Anupallavi and Charanam segments are color coded for easy reading in both. Following this, will be the critical and literary notes. Anecdotal information is given in the "extra comments" section and more general or reflective comments form the last section, "extra extra comments". The Roman scripts used are IAST for Sanskrit and ISO 15919 for other languages. Tamil in particular, is given in the National Library of Calcutta standard, that while being congruent with ISO 15919, also includes alphabets peculiar to Tamil. Follow the label on Tamil Transliteration in the left sidebar for the details. The reason to use IAST is that many readers of 'Sanskrit in Roman' are long familiar with this standard and we need not go to the ISO super-set unless needed. Also, many of my own scripts and programs to process and render Sanskrit are already fixed to IAST. Tyagaraja's language is also highly Sanskritized. A pronunciation guide for this script is available on the left sidebar. Also, I shall use appropriate fonts and transliteration only in the lyrics. In the comments and elsewhere, I shall revert to more familiar phonetic transliterations using only the English alphabet, so that even the new reader can read quickly. So, intentionally, Siva shall be naṭēśa in the lyrics, but Natesha in the commentary, so that it is not a taxing read. But, the actual pronunciation must always be kept in mind. Many of the recurring themes and concepts in Tyagaraja's songs, such as Nadopasana, or Utsava Sampradaya, are generally explained at the first or second occurrence. You may find any definition by navigating this blog using the labels in the left sidebar. A glossary for those concepts commonly known in Indian culture, but not known in other cultures, such as the differences among Brahma of the Trinity, Brahman or the Supreme Self and Brahmans or the priests and scholars, is provided in the book versions. The various themes are developed in the fashion described in the accompanying page. This page also includes a shorter version of the glossary found in the book form. One of the many sources of the original lyrics is the encyclopedic book by Prof. T. K. Govinda Rao. I have a handful of other print sources to cross-check lyrics. All other content, including the translations, be it verse or word-for-word, is original content written from scratch, and I am solely responsible for any lacunae. There are some words in the songs like "galade" which some would insist is more accurately "kalade" and "ganaleni" which is more accurately "kanaleni". There are also issues with the declensions of certain words. The more familiar versions are given here, often in agreement with the aforementioned book. The more fastidious reader may choose to prefer the latter versions. I provide a list of such cases only in the book forms, to keep the clutter in the website low. Only obvious errors in common parlance may have been corrected in our lyrics. When the primary sources are contradictory, I resort to techniques in linguistics and philology as well as original research. So, please note that I am aware of alternate versions and make a case-by-case decision on what to include in this site. This is a rare problem. I don't use special fonts. The original lyrics with the diacritics use only the Georgia or the Times font. The character encoding is set to the Unicode encoding, UTF-8. On most browsers this shouldn't pose a problem. They will probably be configured for UTF-8 encoding or to "auto detect" the encoding on the web page. Most probably your browser isn't taking Unicode and is reading the page as some other encoding. If you reconfigure it to read Unicode encoding, and/or to accept the encoding in the page, you should be fine. If this still doesn't work, you can email me your browser settings and other computer details like operating system etc, and I will look into it. Lastly, blogger's formatting is iffy. I format content here for Firefox. If the formatting is bad on any other browser or screen setting, please let me know. Requests and comments:email lyricaltyagarajablog@gmail.com We love to hear from you! संगीतम् सर्व सिद्धाञ्जनम्। Music clarifies all. Music cleanses all. Last updated- Nov 1 2009. Based on feedback from readers and a review of the new approach I use here, I am making two key changes. Previously, I used to write one song each day and planned to write up to five, so that I covered most of Tyagaraja's oeuvre quickly. Now, subject to health and other vagaries, I plan to write no more than 2-3 songs a week. But, the commentary on the songs will be much more elaborate and comprehensive. I think this will serve the purpose of this website more, as my intent is not to merely provide a compendium of the songs, but to impart, clarify and augment the songs and the wealth in their lyrics. I receive many requests for the book form of this site (Volume 1) and also some questions. I used to send out what was mainly a download of this site, as a pdf document. I have been revising this book form into a much more readable actual book. I will start sending this revised 'Volume 1' out, once it is ready. I do concur with some readers that this is a sufficiently researched work of some academic merit, in a sadly neglected aspect of Indian music. So, once I am sure that I have covered most of thematic content in the songs, on this website, I do fully intend printing this new approach as a serious academic work, as a book set in two volumes. I have thus far remained anonymous on this website. As some readers who have corresponded with me know, I have retained anonymity here only because I am not yet sure of the final form the matter here- as book, newsprint, audiovisual or new media or just this website. I am also not sure if and when I will complete this venture as it is planned to run to over 3000 pages and cover not just Tyagaraja but music, Indian culture and Comparative Literature to the extent possible and meaningful, as suited for the modern reader,- a key consideration being that much literature written on these topics including Tyagaraja is either antiquated by now, or presumes a well informed and invested reader of a certain background or both, whereas my approach here makes no such assumptions of the reader. It is accessible to the modern reader of both kinds- those new to these subjects and to those well versed in it. Our purpose here, is not to just provide a compendium of all Tyagaraja songs or a selection. As the final form and extent are still unknown, I am also not actively promoting this website at various print and online forums. However, it has little to do with privacy and more to do with completeness. I do identify myself as needed, in correspondence I receive on this site. When the final form and extent of the content here is known, I will of course publicize as necessary, this website and any accompanying books or the like and affix my name to the whole as being the party responsible for all its shortcomings. I will at such time, identify those readers and fellow scholars and fellow students of these subjects, who provided suggestions and insightful comments and the one or two who provided reference or other resources to aid in this work. Until such a time comes to pass, I don't think it is necessary to "name names". A question arose recently. If the planned final size of this work is over 3000 pages, am I merely writing yet another encyclopedia in some form, either of Tyagaraja or on the other topics covered here? This is patently not the case. An encyclopedia is of some length and is comprehensive in the breadth of the topics it covers, but not the depth of each item of a topic that it covers. It also may not be analytic at depth and can only record prior opinion and stated fact. That is, in general, it may compile but not develop a subject. I differ in all these respects. I develop a number of subjects through the motif of Tyagaraja and employ rigor, analysis, opinion and innovation extensively. When this work is complete, not only will all the songs of Tyagaraja have been covered, but, the other subjects presented here, will also have been covered comprehensively and the reader may become fully educated not only in Tyagaraja's or Carnatic music, but also in these other subjects. Additionally, many compendiums of Tyagaraja's songs and their meanings exist. I clearly do not abide by their narrow confines here. This work is useful and accessible to all kinds of readers, someone totally new to Indian culture, the informed audience and even the field professional. Finally, a main strength of this work is that, at all times, I never lose track of the relevance to and the immediate context of the 21st century reader. Now, why use Tyagaraja's work to reach into other areas? Because of what Tyagaraja's philosophy was- Nadopasana or Music as worship. To him, music was not just an art. It was all pervasive. In this work, I ardently try to follow his lead and try to illustrate his belief. So, the many purposes of this work now come to be seen. Many translations exist, but not good verse translations that capture his lyricism and this is where the reader and I started our journey. Some good commentaries, at least on portions of his work exist. But, they do not rigorously develop the subject or his Nadopasana thought. These are all my chief aims and rigor is above all. Then, many sources are by now, not pleasant reading, for the twenty first century reader. But, the modern reader is foremost in my mind. The content here must remain readable. Lastly, this work is designed so that it simultaneously makes Tyagaraja's music and the underlying culture available to new audiences and also elucidates even the informed reader in the more involved details. Each song therefore provides us a starting point for inquiry into other aspects. That is, we inquire into Tyagaraja's music and message as a whole and its context far more than we look at minutiae in his music. This is also why we have stood off actual musical detail for a time. The next questions that arise are, "Why Tyagaraja? ", "Why no one else?" and "Is not Dikshitar a better subject for such a development?" Tyagaraja stands unique in two respects,- the spontaneous lyrical reflection of sentiment and his steadfast Nadopasana or Music as Worship thought. Dikshitar did often include very flowery poetry and deep thoughts in his songs. But, he does not always present us these two unique attributes. We are not comparing their musical innovations in any case. Now, Nadopasana has been known throughout the world in some form through the ages, the ancient example being the Pythagoreans. In fact, music having been part of the creation of the universe, just as Tyagaraja sees it as an empowering generator, is a theme in many ancient cultures, even ones halfway across the world, such as the Yecuana people of the South American rain forests. Nadopasana also presents a very different perspective of Hindu philosophy and praxis. Dikshitar on the other hand, leads us towards Yoga, Sri Vidya worship (a mystical approach attributed to Sankara's time; some of his disciples and on occasion Sankara himself practiced it), Advaita (Monism or Non-dualism), Saiva and Shakta schools that worship Shiva and Parvati respectively) and the path of personal devotions, which are all conventional topics. Dikshitar, the only other candidate among Carnatic composers, discusses higher truths and the paths to them in his music, whereas Tyagaraja searches for the higher truths through his music itself. Where Dikshitar communicates his positions with certainty, Tyagaraja searches through the device of his music, and even seems to find syncretism, in songs such as Dvaitamu Sukhama. Lyrical poetry has been lost and rediscovered over the ages around the world and Tyagaraja himself lived during the time of the latter lyric poets of England. All in all, Tyagaraja gives a number of reasons to make such a study into his work useful and meaningful. Coming back to the references, a vast number of sources are used, including the standard books and some obscure ones. Many are print sources. It will not be very useful to merely list the sources on blogger, as the fastidious reader may not be able to immediately access them due to various reasons like copyright and the paucity of digitization. Some sources such as the TKG volume, are consulted far too freely, to even tractably list each instance. In the book form however, detailed notes and bibliographical listings are provided with further comments in some cases. That is, the reader using only this site and not the print of other form, may yet be confident about its authenticity. Any reference used, is so used, only after its academic merit has been ensured. That is, although this content is presented as a website, the references here do not come from simple web searches as might be hastily conjectured, but only through due rigorous process, as should be the case. As mentioned earlier, this website is somewhat like a preview as the content is developed; I am not yet sure about the completion and the final form of this work. When presenting sources such as the Ramayana, Gita, Bhagavatam, Vedas, Upanishads etc., in general, I avoid commentaries including the great classical ones from Sankara, Sayana etc., and stick to the text alone. I even avoid uncommon texts and recensions and stick to only those that are most frequently encountered in modern day praxis and study in the geographic areas concerned, and will most probably have been available in Tyagaraja's time too. The versions of the texts used are also chosen to ensure reliability. For example, I sometimes use the BORI texts. When I do use commentaries or point to more obscure texts, it will mostly be to follow Tyagaraja's own views which were shaped by his antecedents and milieu more accurately,- that is to ensure historicity, authenticity and consistency. Though there have already been a few instances where I have done this, a detailed case worth mentioning, has not arisen so far. Eventually, it will, and the more interested reader may need to keep this fact in mind, at that time. However, to preserve unity of theme, the references used are always kept to a minimum in each song, as befits our main purpose of giving a clear picture of Tyagaraja and his thought, in each song, and to illustrate our new perspective. I hope this note persuades readers of the authenticity of the content here. I endeavor to ensure that it is fit for both reading and study. For additional information, please see this page. If you are interested in the references to a particular song or to some content, please email me, adding why you need the references. In general, I should be able to respond in day or two. *For a specific example, cf. 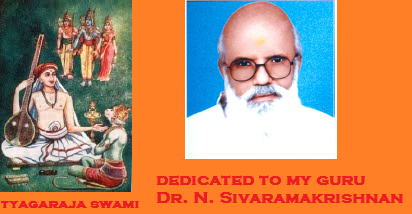 the appreciation essay on "bhavanuta" in the various books of Prof. Sambamurthi, with the presentation of "sri narada muni" here. His books were invaluable as the first attempt to present a modern treatment of Carnatic music. Apart from classical music training, he benefited from both an English education as a lawyer and academic training in music and its theory in the west. Both these songs are connected with Tyagaraja's encounters with divine personages, that of Rama, Sita and Hanuman in the first and Narada in the second. However, though far more formal than prior works, the learned professor's essay, while being elucidating and readable, will not pass the modern day rigors of dispassion, substantiation and historicity. It also presumes an audience of a certain stripe, one in which Rama is revered in praxis, and an audience with full knowledge of the music and the subject, though we must allow for the latter, as most of his volumes were foundational texts and teaching aids and not for popular reading. Though later writers have tightened up, this is still frequently the case with other magazines, books and papers, but it was just safer for me to contrast with a doyen from the past than ruffle any feathers by pointing to any recent journal research article. In our case, I try to ensure rigor and fight shy of needless interpretation, embellishment and re-imagination. I do not presume any attributes in the reader. Also, rather than musical detail, though not only because I am not covering it yet, I would have tried to focus on the actual message. To highlight the message, here and elsewhere, I use comparative studies. I treat Tyagaraja as a poet and thinker and not just a composer, and this reinforces my focus on his message. I might thus be remiss and fall deviant, but Tyagaraja himself comes to my defence. He demonstrably considered his message delivered through music, as being more important than the musical minutiae he decked it with and has repeatedly attested to this in his songs. I don't have to remark yet again that the message is often lost in today's Carnatic music study, performance and appreciation, as so many scholars have done so in the past, including that very writer. Though such a long description of process as the one above may lead the reader to suspect that the dish is overcooked or a hodgepodge, neither was the case. I settled upon the approach here in two distinct steps. The first step was to treat Tyagaraja as a lyrical poet and to render his songs in verse faithfully, something that has not been done well so far. But, when rendering his lyrical imprint, his message immediately follows. Presenting his message in such a variegated approach became a natural second step. All material presented here is only to ensure that these two steps are done right and well. Finally, if and when this work gets completed, the last chapter will consolidate all of Tyagaraja's message and find its place and value in the modern day.